There were numerous public sector industrial disputes in the 1970s. The one that impacted on Doctor Who took place in 1979 and halted production on Shada, the final story of Season 17. It was the last Who tale penned by Douglas Adams, script editor at the time and a British literary legend who published the first of his hugely popular Hitchhiker’s Guide to the Galaxy novels in the same year. Also the writer for The Pirate Planet (1978) and the enormously popular City of Death (1979), Adams was known for his science-whimsy and witty dialogue. The story is largely in Cambridge University, Adams’s alma mater which he later used, alongside other elements from the story in his Dirk Gently novels. The story involves a Gallifreyan book of immense power, a Time Lord criminal and an elderly (very elderly) professor in St Cedd’s College at the University of Cambridge. 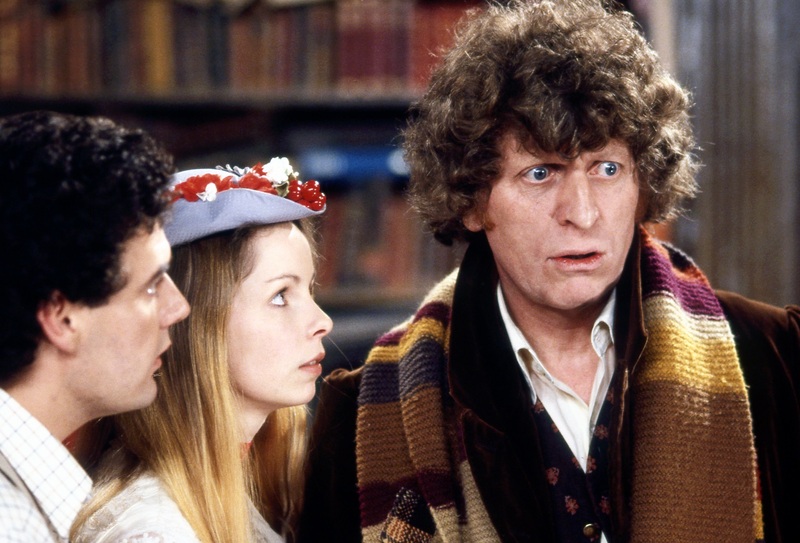 The Doctor (Tom Baker), Romana (Lalla Ward), and K9 (John Leeson) answer a distress call but find room for a spot of punting (pushing a boat with a stick) first. Footage from the location filming in Cambridge was used, four years later, in the 20th anniversary multi-Doctor serial, The Five Doctors (1983) to account for Baker’s Fourth Doctor as the actor had felt it was too soon after his departure to come back. 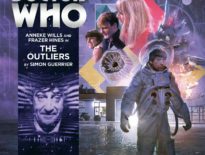 The story was later re-produced as an audio drama featuring Paul McGann’s Eighth Doctor instead of the Fourth and later still, novelised by Gareth Roberts (The Shakespeare Code; The Lodger). There are 7 hours of raw location and studio footage from the recording that did take place and some of this was used to create a VHS release of the unfinished story with Tom Baker filling in the gaps with (rather meagre) linking narration. For anyone who saw this when it came out in the 1990s, it was a rather odd way to experience Doctor Who, though cemented Adams’s reputation as an excellent writer and someone who uniquely understood the tone the series. 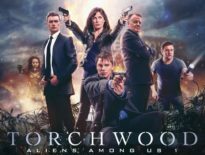 BBC Worldwide held a press preview of the first 40 minutes and a Q&A with part of the team behind the revival. What comes through is the sheer love for the show that everyone involved has. But first – what’s it like?! 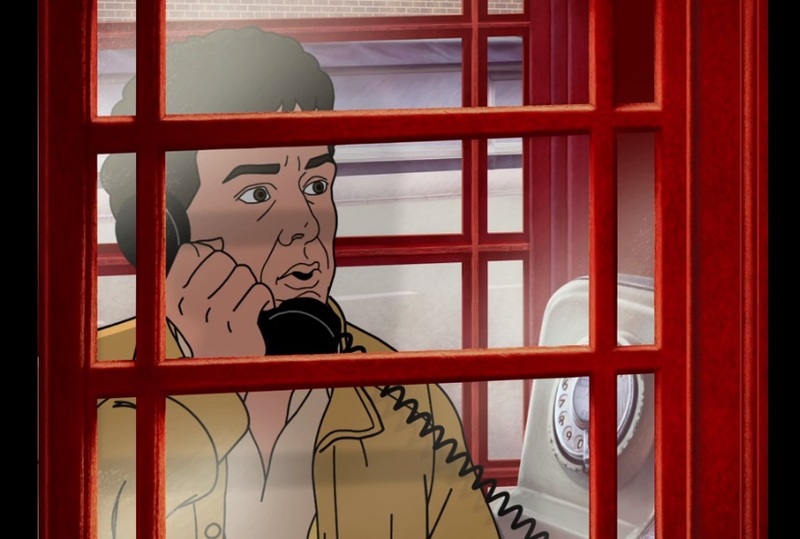 A major concern has been how well animated segments would blend with the live action recordings. I can put your minds at rest – while a story being told in two formats (where that wasn’t part of the original intention) isn’t ideal, it doesn’t hamper the story-telling. The first time we see an animated segment it becomes clear both that the issue of transitions has been thought through and that the animators are looking to impress. Recording scripts for the missing segments don’t exist as these were created during and after rehearsal with the director. 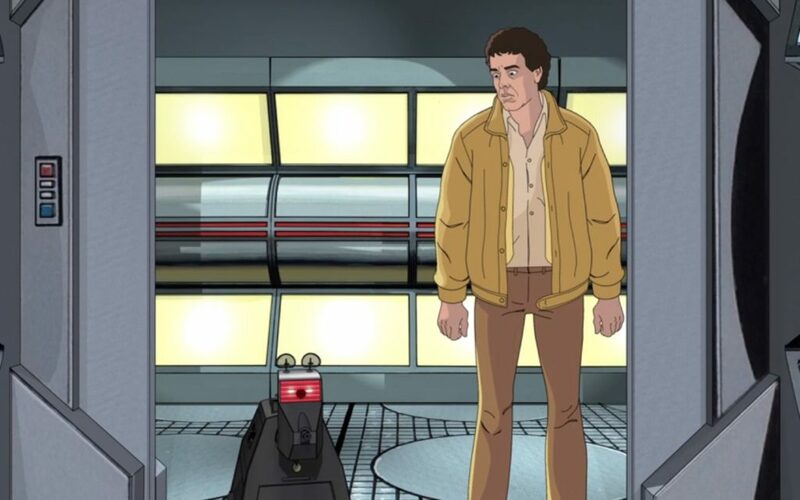 Accordingly, Norton has directed the animated sections with a degree of creativity and whimsy that fits perfectly with a Douglas Adams script. There are touches and additions and, we are told, a swathe of in-jokes to look out for… every book spine and number plate apparently! I particularly found the animation captured the era very well. It seems to fit. But that sums up the entirety of this (re-)production. The laudable Mike Tucker – who provided visual effects and model work in the later years of the Classic series and again on its return in 2005 – is back! The story, in fact, opens with live-action model work especially shot for the completed version using the same 16mm film cameras and specific equipment and effects that were being used in the 1970s – though it’s at the more upmarket end of what Doctor Who was using back then. And it looks perfect. There’s no other way to describe it. We are literally seeing new old Who. This vein of obsessive attention to detail is characteristic of Charles Norton and his team behind the project. The sound recording sessions which reassembled almost the entire original cast (including Shirley Dixon as the Ship’s Computer) used booms rather than standard sound studio mics as this better-matched the sound from both studio and location television recording. The 1979 score was to have been written by Dudley Simpson who sadly passed away earlier this year. His friend and collaborator, Mark Ayers, known for composing on the Classic series and an expert in sound restoration, stepped in for this project. Mark lives and breathes music, and, in particular, the music of Doctor Who. His thorough understanding of Dudley Simpson’s style and the sound of late 70s Doctor Who is clear in the new soundtrack for Shada. Again, the same attention to detail shines through – they used the same synthesisers and assembled sessional musicians to record the score in the same way it would have been done in 1979. I recall the story from the 1992 VHS compilation and the bottom line is that it’s great. Adams was reportedly not that keen compared to his other work on the series, but this has some wonderfully observed character moments, some proper jeopardy, whimsy and wit and appalling 1970s fashion. It’s everything you could hope for – this is a welcome return of a missing classic. He noted at the time that none of the cast imagined that the story would never be completed. They had all thought that it would be re-mounted given the prominence of Doctor Who in the BBC’s schedule at that time. There was a silver lining for Hill, however, who met a junior production assistant, Olivia, while filming Shada who later became his wife. Olivia was also at the preview and recalled that the Director, Pennant Roberts, had been “very calm – very supportive” during the strike and that, regardless of the ultimate problems, there was “a lot of giggling”. I’ve mentioned obsession and attention to detail – this went further. Rest assured: we won’t spoil it for you. A touching and appropriate nod to a much loved body of work. 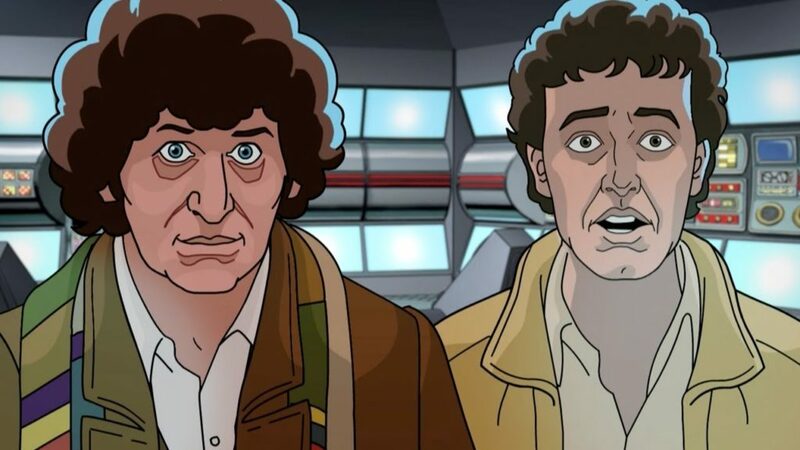 Shada gets a thumbs up from The Doctor Who Companion – a little bit of Christmas come early. 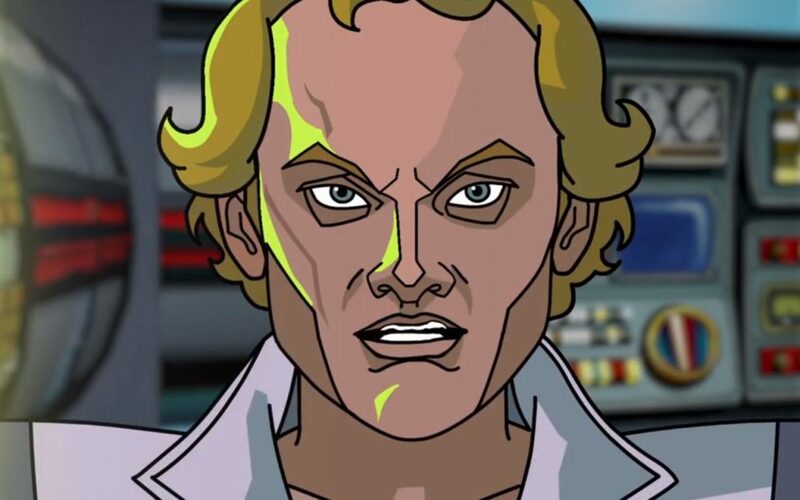 Doctor Who: Shada can be purchased from iTunes now. Its DVD and Blu-ray release comes on 4th December 2017.